Close to two-thirds (63.6%) of public schools have at least one convenience store within a radius of 750 metres. Half (51.2%) of public schools have at least one recreational facility less than 750 metres away. Close to two-thirds (63.3%) of the most disadvantaged public schools have a built environment characterized by high walkability. Less than half (42.7%) of public schools have at least one bike path within a radius of 750 metres. 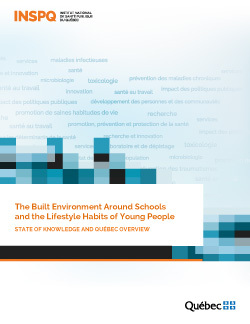 Actions could be initiated to establish environments more conducive to healthy lifestyle habits around schools.